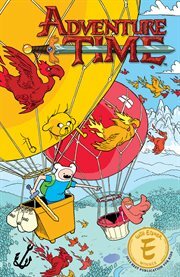 The item Adventure time, Volume 4, issue 15-19, (ebook) represents a specific, individual, material embodiment of a distinct intellectual or artistic creation found in Charlotte Mecklenburg Library. Join best pals Jake the Dog, Finn the Human, and... the ICE KING?! It's a DUNGEON BROVENTURE as this crazy trio jumps into a game of danger of feelings! Will the treasure at the end be worth all the crazy emotions, or have Finn and Jake finally found a quest they won't be able to finish?